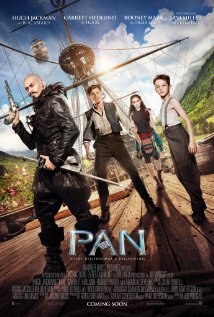 I don't dislike too many movies but Pan was a movie that should not have been made, at the very least until they could get it right. The story was rushed and characters were smashed into our faces with little to no backstory. Pan also had too much CGI and should have backed off. Some scenes looked faker than fake and even the actor who played Peter (Levi Miller) looked computer animated when he didn't need to be. Blackbeard (Hugh Jackman) was hard to follow. Hugh has roles where he dominated: X-Men, Les Miserables, Prisoners...but this was one I didn't enjoy him in. Other main characters like the iconic Hook (Garrett Hedland) and his sidekick Smie (Adeel Akhtar) made this a little better to watch with the comedy they brought forth, especially Smie. A love interest between Hook and Tiger Lily (Rooney Mara) was also forced. No chemistry was really there to begin with except some cheesy smiles. I put Pan on the pedestal and went in with high hopes and that was my downfall. Movie trailers made this movie better than it was. I wouldn't suggest seeing this movie.